A dozen years ago, recycling was a gangly wide-eyed youth, all arms and legs and save-the-planet idealism. Now it’s grown up and faces these pesky problems that come with adulthood. Shareholders want their dividends. Ratepayers want low rates. Workers want raises. That youthful promise doesn’t cut it anymore. I don’t care what kind of grades you got in college, kid, you’re in the real world now. Let’s see your stuff. The next morning, I follow the money to Emeryville. I call James Wilcox at work, but he’s out, so I decide a face-to-face interview is worth a try. I learn more in person. I look unthreatening—put me in a UPS uniform with a package and all anyone will remember is the brown uniform. I’m not feeling bouncy this morning. The gash on my cheek is small enough I don’t feel like a pirate, but I’m tense in the crick beneath my shoulder blades, and I can’t seem to untie the knot tightening between my temples. And I wasn’t doing so great before my fight with Doug. To be honest, my life is pretty fucked up at the moment. I live illegally in my office, in a low-slung wooden 1920’s warehouse, a warren of dance studios and art galleries and the toxic-sweet scent of petroleum products wafting through the low-ceilinged hallways. I know my glass-blowing neighbor Maya sometimes spends the night here. Sometimes when I pad to the bathroom around midnight, I can see her stove burning orange though her partly ajar door, and then long after I’ve made my coffee and read my newspapers and started on my workday, I’ve seen her open her studio door from the inside. But I know she has an apartment, or did, and she has her boyfriend’s place as well, though I sense she’s not so sure about this boyfriend. This sleeping in my office is temporary. I’m just trying to save some money and get my bearings back. The bustling, post-industrial West Berkeley neighborhood I walk through from my studio toward Emeryville is an area in transition. Most, but not all of the old steel foundries and manufacturing plants have flown off to Kuala Lumpur or Tijuana. Dozens of retrofitted industrial shells now house an eclectic mix of dance companies, software startups, consumer boutiques, rug importers, publishers, pottery collectives, and artist studios. On the block next to mine the 19th century collides with the 21st—the Berkeley Brass Foundry, a brown-brick fortress erected in 1895, squats across the street from a sleek glass and steel cube that houses a biotech startup. There are still enough railroad tracks, workers with hard hats, and peppy ladybug-like forklifts zipping to and fro to give the neighborhood a gritty feel, but you can also find a good cappuccino within four blocks in any direction. Maya hates it. “Friggin’ Starbucks’ll be here soon,” she snarls. I second that snarl, but secretly I like the mix, wish I could freeze the moment, savor it, like those last chapters of a satisfying thriller. But I can’t. That’s why they’re called transitions. They don’t last. Emeryville, ten minutes from my studio, has already “gone over to the dark side,” as one of my friends says. But the neighborhood where Brady and Wilcox live is as shabby as ever. The row of one-story brick townhouses has the charm of Army barracks, only less so. The Brady/Wilcox place is not as ramshackle as Doug described, though it’s on the same block as the house with the knee-high weeds and the clunker up on blocks. I don’t hear anything when I press the doorbell, so I rap loudly on the door. With each knock there’s a thin metallic ring, as if an empty coat hanger is rattling on a hook. A woman with fluorescent red hair opens the door a sliver. Doug didn’t describe Lynn Brady, but I imagined a sugary hillbilly housewife in an apron. Not even close. Tall, late twenties, pink and punkish with black horn-rimmed glasses, she wears her hair in a severe slant from crew cut short in front to long and straight in back. A silver stud pokes through her nose. I hear the Beatles’ “Ob-La-Di, Ob-La-Da” playing behind her. “Uh huh,” she say, gripping the door as if she’s ready to swing it closed. All I can see is her face and neck. The color drains from her cheeks. Her eyes dart from side to side, as if looking for an escape route. I nudge the door open with my knee. I didn’t plan to scare her, but I’m so used to professionals like the Consolidated Scavenger press reps who don’t flinch when I ask them tough questions. I felt bad, but also good that I was able to strike fear into someone. She did appear to genuinely not know anything, but she was also more nervous than the circumstances dictated, even before I jabbed with the felony line. Next I visit the third floor at city hall. I’ve never met Sheila Womack or Chris Wass. I try Wass first, but no one answers. I approach Womack’s office cautiously. Doug blasted me for not being partisan enough. Womack is likely to feel the opposite. The door is open a few feet and I hear two voices. I recognize the first as Gill Sykes, Womack’s aide. I met him once at a solid waste commission meeting. He wore a double-breasted suit and a diamond earring, the other six of us were in jeans and T-shirts. Doug described him as “ambitious with a capital A.” He’s a slight African American man about the same build as me, maybe thirty years old. I don’t know who it is, but it’s not Womack. I crane my neck to get closer. All I can see is a wall of bookshelves and a bicycle helmet. “You didn’t look both ways before jumping into my bed,” she says, sounding disparaging and seductive at the same time. Then comes a thunk on the floor, like someone dropping a heavy bag, followed by the slurpiness of a kiss. Then whispers. The hallway is empty. I edge closer to the opening. Suddenly, the door opens inward and she walks out. I twist quickly to my left and scoot over to the bulletin board. The woman, tall and thin with shoulder-length blond hair and a glint of turquoise earrings, catches my eye before I turn. I swallow and arch my head towards the board to study the agenda for the upcoming meeting on off-leash dogs. “You were listening, weren’t you?” she says. I put my finger on the board as if to read the notice better. Pretend I don’t hear her. But I feel her stare boring through my back. Go away. Please. But I’ve been yapping at myself about not being timid. So I turn to face her. Wow, she’s gorgeous. Delicious lips with whitish-pink gloss, long pale legs with a sparkling green ankle bracelet. “Hi, my name is Brian.” I offer my hand and give her a warm smile. She hesitates, more anxious than angry. I keep my hand outstretched. “Abby,” she says, and gives me a tepid handshake. She looks at me with suspicion, then opens her hands as if to say, go ahead, whatever, but I’m skeptical. I grab a pen and notebook from my pack and stand poised to write down her number. She pulls sunglasses out of her enormous purse and puts them on. “And stop following me, or I’ll call the police.” She hurries down the stairs. Okay, she didn’t believe me. So what? I grin to myself, pleased with my impromptu performance. Not only did I disarm her, or distract her at least, I managed to practice my flirting at the same time. So unlike me. Unlike the old me, that is. From the stairwell railing, I follow Abby’s head as it gets smaller and she flits through the first floor lobby to the Milvia Street entrance. I turn back to Womack’s office, but Sykes is headed out the door. I walk next to him, tell him I’m a reporter for the Beat, and ask him if he can answer some questions about contributors to Womack’s campaign. He stops with one hand on the railing and his feet on different steps and whips back towards me, but then his frown melts into a smirk. Not only was Wednesday the last day of April and the hottest day of the year, it marked the 40th month that I’ve exercised every day. * That’s 1,216 days, but who’s counting? I hiked my regular loops — Tennessee Valley-Coastal Trail-Fox Trail. Four miles. An hour and 10 minutes. About 1,000 feet of climbing. Gorgeous views. That photo at the top of the page is from this trail. I started keeping track on January 1, 2011. My goal at that time was every day for the year. When 2012 arrived, I kept on going. Of course, my reward for reaching this milestone is to keep at it for another 40 months. At least. 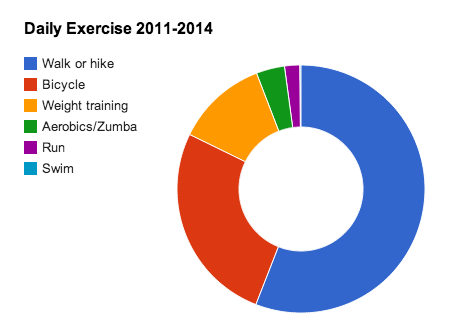 So what counts as exercise? Walking, certainly. That’s what I do more than anything. Then, in order of frequency, there’s bicycling, lifting weights, Zumba/aerobics class, and, hardly ever, swimming and running. I’m not an athlete. When I bicycle to the city, the only cyclists who don’t pass me are tourists on rented bikes. After 15 years of Aerobics or Zumba, I still feel like a beginner. Most of the time, I do these physical activities myself, though I frequently walk with my wife and/or with friends. One key to making the every-day routine work is, whenever possible, walking or bicycling to where I need to go anyway. For ten years, I commuted to or from work 2-4 times a week, from Mill Valley to downtown San Francisco. I walk to and from grocery stores, cafés, meetings, friends’ houses. As you can see, my most common activity, by far, has been a walk or hiking. But when does a walk become a hike. When I wear hiking boots and it’s on a trail? When it’s long and steep? Going to Peets on city sidewalks is a walk. 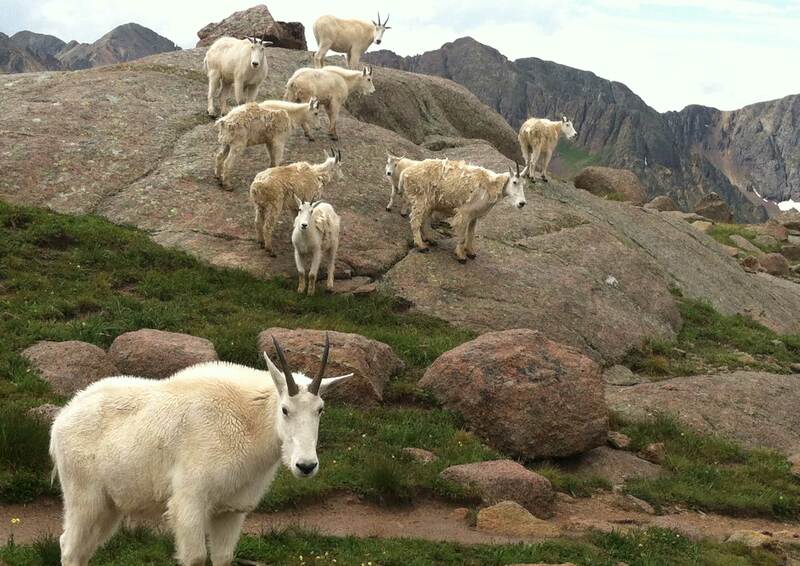 Climbing a 14,000-foot-peak in Colorado is a hike. Here are some photos of memorable walks and bike rides. Walking from my mom’s apartment in Edgewater to downtown Chicago (about 6 miles). Here’s Lake Michigan on a cold winter morning. Backpacking in a very different Chicago — the Chicago Basin in Colorado’s Weminuche Wilderness — with a wonderful group of Sierra Club folks two years ago. My first three (and only three) 14ers. I took most of my hundreds of rides to or from San Francisco as the sun rose or set. Here’s Richardson Bay on the way in. And here’s a recent hike with my love Z at Goat Rock Beach on the Sonoma Coast, where the Russian River meets the Pacific. Sometimes this daily habit is a chore. I wish I didn’t have to do it. Like bicycling toward the Golden Gate Bridge on a summer evening, directly into the cold fog. Or dragging myself up the last steep hill home. That’s when I tell myself that I’m grateful I can still do it, that I’ve avoided injuries, pain, and never really been sick. I’d like to believe my habits have something to do with that, but there’s no denying luck and genes. I know that can’t last forever, but my goal is to keep this going for as long as I can. One day at a time. *As to that asterisk above, in the first paragraph, no, I’m not taking steroids. But I did miss one week with the flu in June of 2012. I made up for it. For Christmas in my family, we pull names out of a hat and give one present to one person. My brother Pat got me back in December, and he suggested maybe he could come out here from Chicago and help with a project. Yesterday, we started that project — building a rock wall and path for a garden bed on the steep hillside outside my house in Mill Valley. We were stiff and tired last night — maybe the beers contributed to that — but what a great present. Other than the expense of buying the rocks and gravel and stepping stones, I would do this again in a second. Good thing, because after breakfast, we go at it again. We made excellent progress on our first day, more than I expected, but we’re not done yet. The rock wall is complete (and there are enough rocks left to build another one) and eight of the stepping stones are laid, but we have another dozen or so to go. Plus we had a little mission creep and now we’re also going to redo some of the existing steps down the hillside, which have been an accident waiting to happen. Here’s what it looks like so far. Not bad for a couple of middle-aged men who sit in front of screens most days. 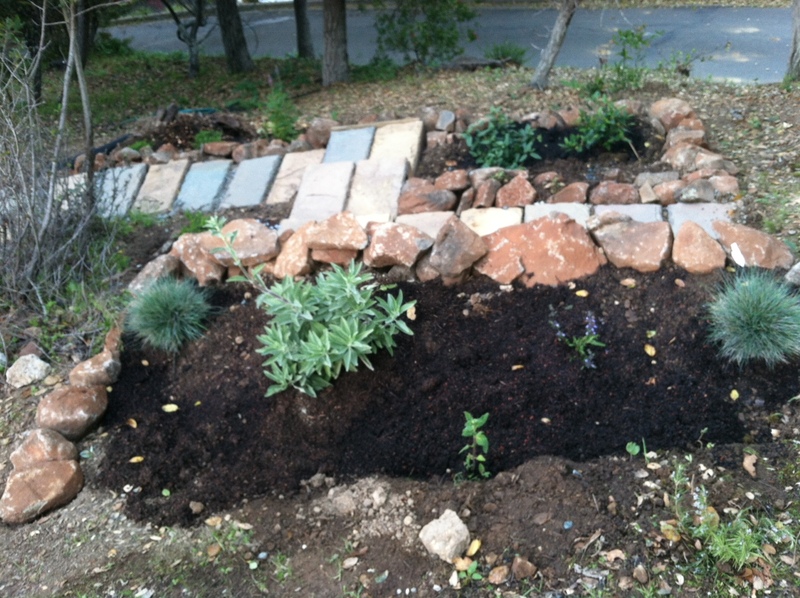 Here’s the before photo, with a couple sample rocks. When we selected the rocks, Sonoma fieldstone, the most local and the least expensive, we learned that there are two main sizes, heads and double heads. The double heads were pretty heavy, but we didn’t need many of them. Those were for the bottom row, to create a strong, stable foundation. It’s Saturday morning. We’re already done. We alloted ourselves three days and finished it in two, even with the mission creep. (Here’s to setting modest goals.) We even did some planting. Here’s a view from above. It already looks good, but will be even better as the plants grow. We also came up with a new startup idea: Stone Age Fitness. You pay us to be your personal trainers, and we put you to work carrying rocks down steep hillsides. Here’s Pat posing for our promo. Minimal Planning, Mostly Improvisation: My plan had been to sketch out the wall and garden using my rudimentary landscape design skills. I did map out my yard in Berkeley, years ago, but it was a flat rectangle. Easy to measure. This is a curved corner lot on a steep hillside. I took a number of measurements, but never did more than the most cursory sketch. (Enough to show it to José at American Soil Products where we bought the stones, so he could help us estimate how many we needed.) More important than the sketches was reading up on some web sites and landscape design books. What we built is called a “dry-stone retaining wall,” with no mortar to hold the stones together. The Incas built huge walls and agricultural terraces using these methods 600+ years ago. Similar walls from centuries ago have been found in Ireland, Scotland, Zimbabwe, China, and many other places. To prepare fields for planting, farmers had to remove rocks from the soil, so they were right there at hand, ready to be used for any needed structures. Please note: This is not a how-to. We’ve never done this before. We don’t know if the rock wall will come tumbling down in a downpour, will fall over when some deer kicks it. I know more than I did a week ago — that’s as much as I can promise. What I did do that served as a starting point was approximate where the walls and pathway would be with hoses and stakes. After walking around our worksite, we made some adjustments to these boundaries and started digging. Fortunately, we had some heavy rains in February and the ground was soft and easy to dig. We piled the dirt on a tarp we spread out on the hillside, with an old plastic turtle sandbox on top to serve as a backstop and prevent the dirt from sliding down the hill. The Flat Earth Society: For the rock wall and steps to be stable, we needed first to create a level surface. We cut into the hillside with picks and shovels and then, using a tamper from the Berkeley Tool Lending Library — Yay Berkeley — created a strip about three to four feet wide. Then we poured gravel on that strip and tamped it again. That was wide enough for both the foundation of the wall and the flagstone steps in front of it. The original specs were for one rock wall about a foot deep, two feet high, and six to eight feet long, leaning into the hillside, holding a garden bed about four feet deep. Almost as important was a level pathway in front of the garden and connected to the steep steps along the side of the house. The hillside is steep enough that it’s a challenge to find any spot where you can stand with both feet at the same level. On the morning we started the job, we got two pallets delivered to our driveway with 1.5 tons of Sonoma fieldstone, 15 rustic green rectangular flagstones, each 1 foot by 2, and four bags of gravel, nowhere close to how many we needed. We laid the flagstone steps first, because then we could stand on them while we built the wall, which went up surprisingly fast. We did have to lug a lot of rocks thirty feet or so down these steep treacherous steps from the driveway to the worksite. Below you can see Pat standing on the first three steps we laid and the cut we made into the hillside. The next shot shows the beginning of the wall. We angled the wall ever so slightly in toward the hillside, and when we reached about a foot high, we filled behind it with lots of gravel (for drainage) and some of the dirt we had dug out earlier. The stacking of the rocks was like putting together a puzzle. At first, I was looking for specific shapes, then I found it made more sense to just pick one or two rocks and then find the best spot for them on the wall. We did our best to overlap one double head on top of two heads, the way a brickmason would overlap bricks. We completed most of the rock wall and six of the flagstone steps by midday and then we had to go out and buy some more gravel, flagstone steps, and lumber. You can see below, just to the left of the yellow pick, the way the lumber framing allows us to move down the hills and keep the flagstones level. As I said, we had more rocks than we needed for one wall, so we built additional ones, to create another planting area, but mostly to give more support on the downhill side of the flagstones. So a hard rain wouldn’t wash out the gravel and dirt underneath them. Natives, Not Vegetables: My original thought was to grow greens in the bed — chard, kale, lettuce, spinach, and so on. (Not enough sun or heat to grow tomatoes.) I knew that because of the deer, we would need to build some sort of cage to cover the bed. I did more sketches of that than the rock wall itself. I’m a newcomer to this hillside home. My wife has lived here for more than 20 years, I’ve been here less than one. She likes the natural oak woodland look and I promised that the garden bed project would be in keeping with the natural surroundings. Certainly the rock wall seems very organic. If we dug deep enough, we’d probably find rocks just like the ones we piled into a wall. But a cage over the bed? That could be ugly. So we decided instead for native perennials that were deer-resistant, and went down Friday afternoon to the native plant nursery at Tam Junction and picked up two coffeeberry bushes, three sages, and several grasses and groundcovers. Here’s our planted garden from below. Pretty great, huh? While these are native plants, they may take a year or more to get fully established. Especially given the drought. But once they do, well, they’ll act as if they belong here. I’m not truly lazy. I would never garden if I were. I can buy organic produce at any number of nearby grocers and most have flowers too. But there’s something about growing them myself that I can’t shake. But. After more than twenty years living in the flatlands of Berkeley, where I built garden beds and amended the soil with compost and manure and had sun for most of the day, I’m now living on a steep shady hillside in Mill Valley where deer nibble at everything, even allegedly deer-resistant plants like oleander. Oh, and we’re now officially in a drought. The good news is that the winter days here have been sunny and gorgeous, with mid-afternoon temps in the high 60s and now and then hitting 70. Downright criminal for January, especially for a kid who grew up in Chicago. But I can wear shorts outside. In January. The hillside is full of oak and bay trees and there’s a natural beauty to it that i want to keep, but I still have visions of terraced garden beds lush with vegetables and flowers. Here’s a shot of my backyard garden in Berkeley from a few summers ago. And here’s the hillside this morning. I know the overgrown Berkeley look is not appropriate for the hills of Marin, especially during a drought. But maybe I can create a little oasis among the oak and chaparral. A neighbor down the hill has just had his backyard landscaped, and that’s given me some ideas. See those curving rock walls and the steps up the hill. It’s much more ambitious than I can even consider right now, Doesn’t stop me from dreaming. Actually I’ve been imagining rock walls ever since our visit two summers ago to the Inca Trail and Sacred Valley. Here’s one of the many Inca sites we visited, full of mortarless rock walls and irrigation channels that carried water down from the mountains. (FYI, I tried to identify that photo above, which I took, but didn’t identify. I gave up before I could, but I did find a portfolio of terraced farms, mostly from Vietnam and China. Also a few from Peru. These visions will have to wait. (There’s lazy and there’s lazy.) I did start a garden this week, however. I started small. With a wheelbarrow, a planter box, and seeds. I repurposed an old metal wheelbarrow, full of holes from rust, lined it with landscape cloth, filled it with potting soil and compost, and planted mesclun (summer salad mix) and arugula seeds. I know arugula grows easily from seeds. We’ll see about the lettuce mix. The easiest way is to string a net across the five-foot wide entrance to the deck, but that means hooking and unhooking when we go in and out through the front door. Another option, which I’ve working on, but isn’t finished, is a lightweight hoop/cage that fits over the top of the wheelbarrow. You can see what I have so far — it’s made from water sprouts pruned from my pluot tree in Berkeley, bent and held together with twine. It’s fallen apart once, but Iwith some patience, I can make it work. Once I get the “skeleton” stable, I’ll attach some a screen over the top and that should keep out the deer. My other venture was even easier, though I had to pull out my drill. I screwed two metal brackets into the railing posts of the lower deck, high enough above the ground that even a deer on stilts can’t reach it, set an old redwood planter box on them, and planted about 15 ruby red chard seeds. Will thin later. I added a spoonful of 5-20-5 fertilizer I found under the house. I have no drip irrigation set up here in Mill Valley so for now I will have to hand water, every day until the seeds germinate. It may be a while before I built the rock terrace walls. But I think I’ll buy a new hose this weekend.